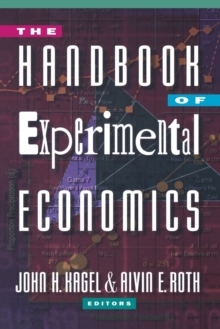 This book, which comprises eight chapters, presents a comprehensive critical survey of the results and methods of laboratory experiments in economics. The first chapter provides an introduction to experimental economics as a whole, with the remaining chapters providing surveys by leading practitioners in areas of economics that have seen a concentration of experiments: public goods, coordination problems, bargaining, industrial organization, asset markets, auctions, and individual decision making. The work aims both to help specialists set an agenda for future research and to provide nonspecialists with a critical review of work completed to date. Its focus is on elucidating the role of experimental studies as a progressive research tool so that wherever possible, emphasis is on series of experiments that build on one another. The contributors to the volume--Colin Camerer, Charles A.
Holt, John H. Kagel, John O. Ledyard, Jack Ochs, Alvin E. Roth, and Shyam Sunder--adopt a particular methodological point of view: the way to learn how to design and conduct experiments is to consider how good experiments grow organically out of the issues and hypotheses they are designed to investigate.